The Lao Airlines flight plunged into the river on in bad weather on Wednesday. The aircraft sank to the bottom and volunteers have been searching the swollen river in boats of all sizes. It is believed the bodies of all Australians except one may have been recovered. The fuselage of the plane has not yet been found and it is believed that many more may still be inside. French experts are on the ground looking for the black box flight recorder. 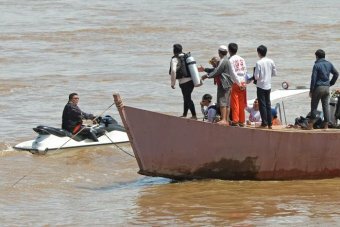 Thailand has sent in more divers and a sonar machine and Australian Federal Police are in Pakse helping with identification of the victims. Bodies are currently being held in a makeshift morgue with no refrigeration or formal identification process in place. Australia's Department of Foreign Affairs says it would not confirm if the bodies of Australians have been found until that process is complete. Soubinh Keophet, a former national footballer and volunteer with a Laos rescue foundation, said one body was found about 30 kilometres from the crash site. "We travelled 50 kilometres along the river and found four bodies," he said. Sommad Pholsena, Laos minister of public works and transport, told reporters an 18th body was being recovered from the water today. Sommad Pholsena, Laos minister of public works and transport, told reporters an investigation into the crash is underway. "We have to investigate about the cause of the accident but initially I think it was caused by bad weather," he said. Thai navy divers and Lao authorities have been in meetings trying to work out how to retrieve the plane, the exact location of which is not yet known. Rescuers said recovering the wreckage would be an extremely difficult task, complicated by raging currents. The flight from the capital Vientiane was carrying 44 passengers and five crew, including 28 foreigners, when it crashed near Pakse airport in Champasak province. Rows of wooden coffins have been seen at a mortuary in Pakse. Lao Airlines said the aircraft hit "extreme" bad weather while witnesses described seeing the plane buffeted by strong winds. According to an updated passenger list from the airline, there were 16 Laotians, seven French travellers, six Australians, five Thais, three South Koreans, three Vietnamese, and one national each from the US, Malaysia, China and Taiwan. Gavin Rhodes, his wife Phoumalaysy - know as Lea - and their two young children, who lived in Sydney, were killed along with Michael Creighton and his father Gordon, who were both from New South Wales. The pilot was a Cambodian national said to have "many years" of flying experience. French-Italian aircraft manufacturer ATR said the twin-engine turboprop aircraft was new and had been delivered in March. There have been 29 fatal air accidents in Laos since the 1950s, according to the Aviation Safety Network. Previously its worst air disaster was in 1954 when 47 people died in an Air Vietnam crash near Pakse, the organisation said.